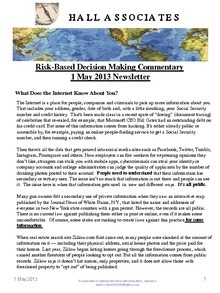 Send us an email to get on our email list for the newsletters. 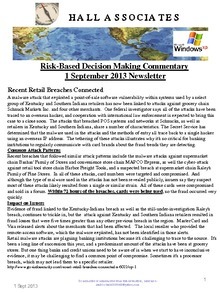 In addition to the comprehensive training in the various risk environments we conduct, we are also providing a series of Risk Newsletters that discuss specific risks & recommend actions to take, training to get or contingencies to put in place to control or plan for each risk occurring. 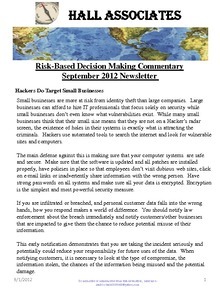 This series of newsletters responds to questions received from Business Owners & employees & discusses what can affect you & how you should respond to protect your business, your employees & yourself. 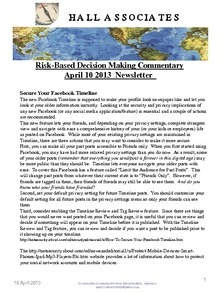 If you have any questions or comments & want to subscribe, let me know. 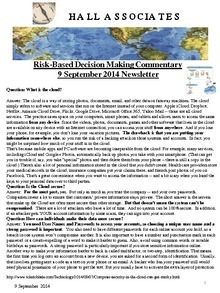 Question: What is the cloud? 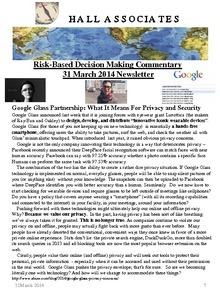 Download "Newsletter 9 September 2014.pdf"
Download "Newsletter 5 September 2014.pdf"
Download "Newsletter 1 September 2014.pdf"
Download "Newsletter 25 August 2014.pdf"
Does Google have the right to scan user emails? 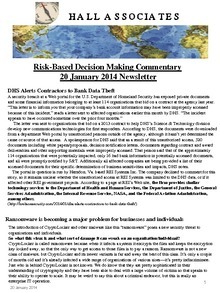 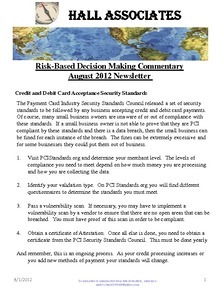 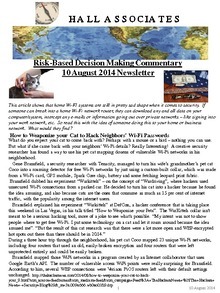 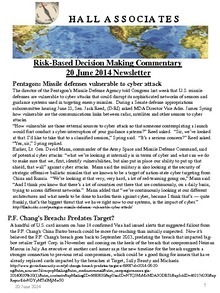 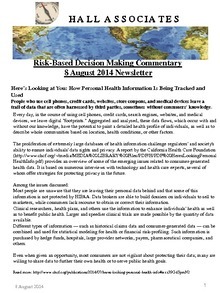 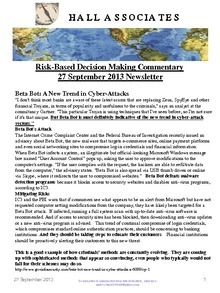 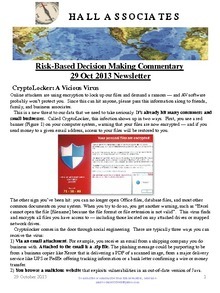 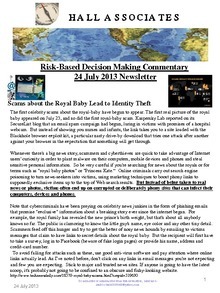 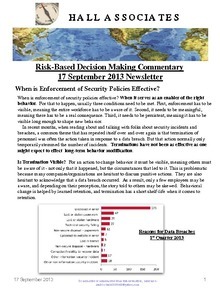 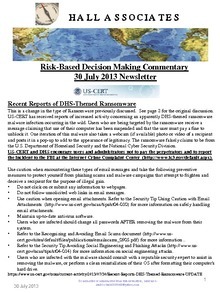 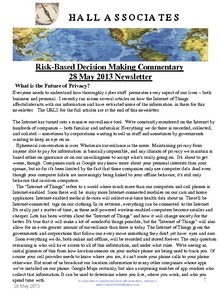 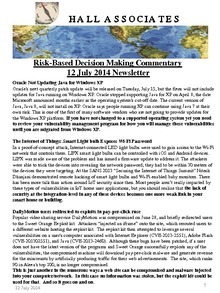 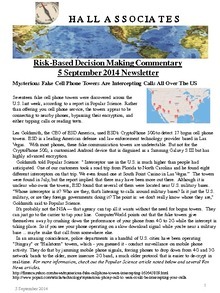 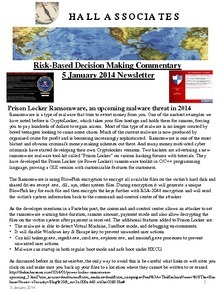 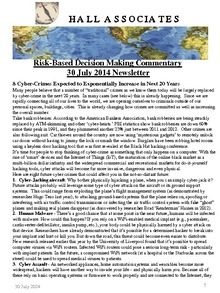 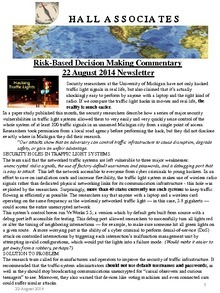 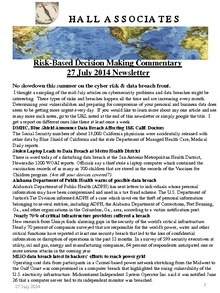 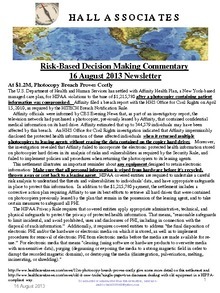 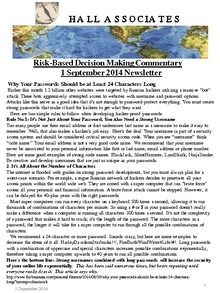 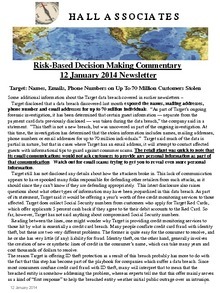 Download "Newsletter 22 August 2014.pdf"
Download "Newsletter 10 August 2014.pdf"
Download "Newsletter 8 August 2014.pdf"
Download "Newsletter 30 July 2014.pdf"
No slowdown this summer on the cyber risk & data breach front. 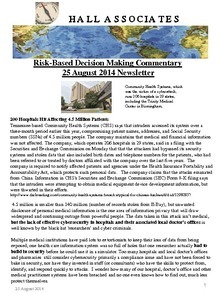 Download "Newsletter 27 July 2014.pdf"
Download "Newsletter 20 July 2014.pdf"
Download "Newsletter 12 July 2014.pdf"
Download "Newsletter 20 June 2014.pdf"
Download "Newsletter 15 June 2014.pdf"
Download "Newsletter 11 June 2014.pdf"
Download "Newsletter 1 June 2014.pdf"
Download "Newsletter 20 May 2014.pdf"
Download "Newsletter 28 April 2014.pdf"
Download "Newsletter 23 April 2014.pdf"
Download "Newsletter 14 April 2014.pdf"
Download "Newsletter 5 April 2014.pdf"
Download "Newsletter 31 March 2014.pdf"
Download "Newsletter 12 March 2014.pdf"
Download "Newsletter 6 March 2014.pdf"
Download "Newsletter 28 February 2014.pdf"
Download "Newsletter 21 February 2014.pdf"
Download "Newsletter 17 February 2014.pdf"
Download "Newsletter 12 February 2014.pdf"
Download "Newsletter 5 February 2014.pdf"
Download "Newsletter 23 January 2014.pdf"
Download "Newsletter 20 January 2014.pdf"
Download "Newsletter 15 January 2014.pdf"
Download "Newsletter 12 January 2014.pdf"
Download "Newsletter 5 January 2014.pdf"
Download "Newsletter 2 January 2014.pdf"
Download "Newsletter 19 Dec 2013.pdf"
most of the old ones are still risks also. 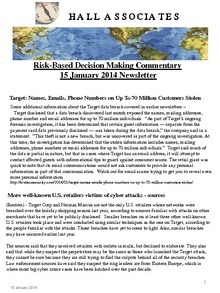 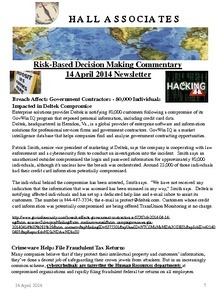 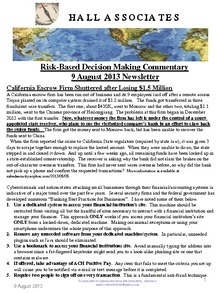 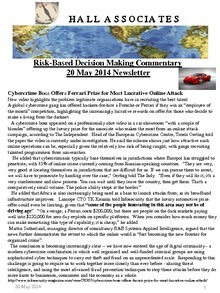 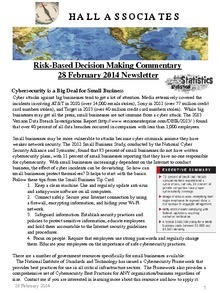 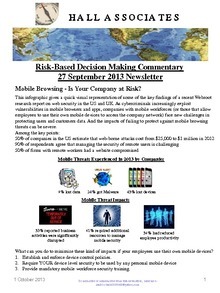 Download "Newsletter 12 Dec 2013.pdf"
Download "Newsletter 16 Nov 2013.pdf"
Insurance: Irresistible to Cyber Criminals ? 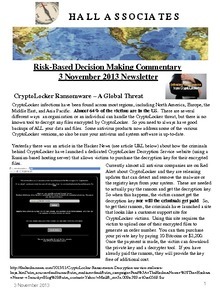 Download "Newsletter 3 Nov 2013.pdf"
Download "Newsletter 29 Oct 2013.pdf"
Download "Newsletter 25 Oct 2013.pdf"
Download "Newsletter 20 Oct 2013.pdf"
Download "Newsletter 16 Oct 2013.pdf"
Download "Newsletter 14 Oct 2013.pdf"
Download "Newsletter 8 Oct 2013.pdf"
Download "Newsletter 1 Oct 2013.pdf"
Download "Newsletter 27 Sept 2013.pdf"
When is Enforcement of Security Policies Effective? 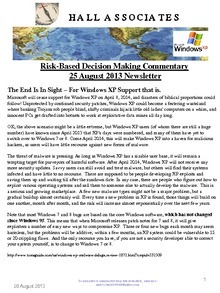 Download "Newsletter 17 Sept 2013.pdf"
Download "Newsletter 5 Sept 2013.pdf"
Download "Newsletter 1 Sept 2013.pdf"
The End Is In Sight – For Windows XP Support that is. 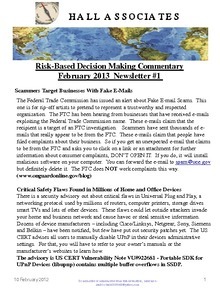 Download "Newsletter 25 August 2013.pdf"
Download "Newsletter 20 August 2013.pdf"
Download "Newsletter 16 August 2013.pdf"
A cyber-attack that hit Harbor Freight Tools and likely exposed card data processed at all 400 of its retail tool stores could rank among one of the biggest retail breaches this year. 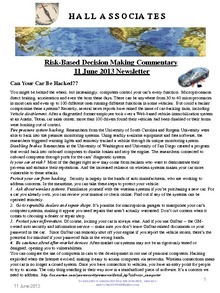 Download "Newsletter 9 August 2013.pdf"
Download "Newsletter 30 July 2013.pdf"
Download "Newsletter 24 July 2013.pdf"
Download "Newsletter 17 July 2013.pdf"
Download "Newsletter 3 July 2013.pdf"
Can Your Car Be Hacked?? 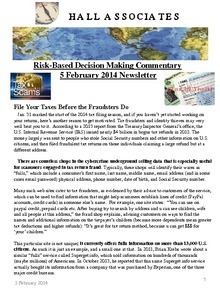 Download "Newsletter 11 June 2013.pdf"
Download "Newsletter Feb 10 2013.pdf"
Download "Newsletter Feb 20 2013.pdf"
Scam artists use clever schemes to defraud. And they are getting better at it. 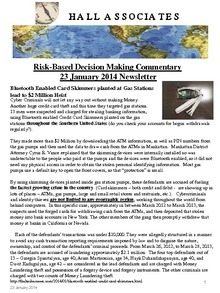 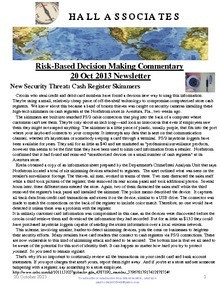 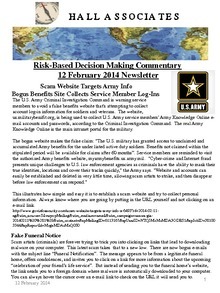 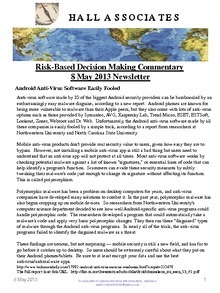 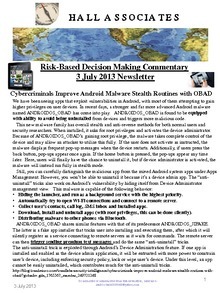 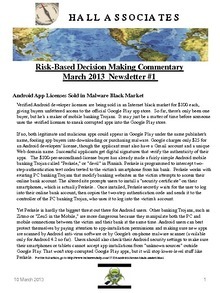 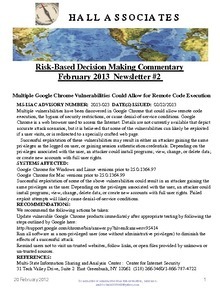 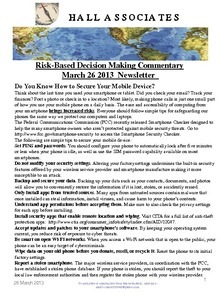 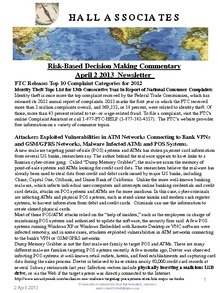 Download "Newsletter March 10 2013.pdf"
Download "Newsletter 26 March 2013.pdf"
and GSM/GPRS Networks, Malware Infected ATMs and POS Systems. 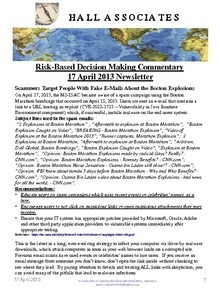 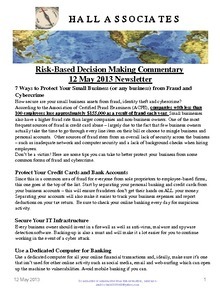 Download "Newsletter 2 April 2013.pdf"
Download "Newsletter 10 April 2013.pdf"
Download "Newsletter 17 April 2013.pdf"
Download "Newsletter 22 April 2013.pdf"
Download "Newsletter 1 May 2013.pdf"
What security secrets might an attacker unearth about your business on Dropbox? 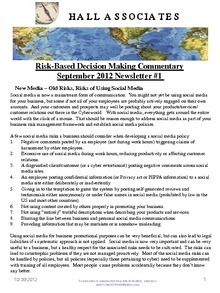 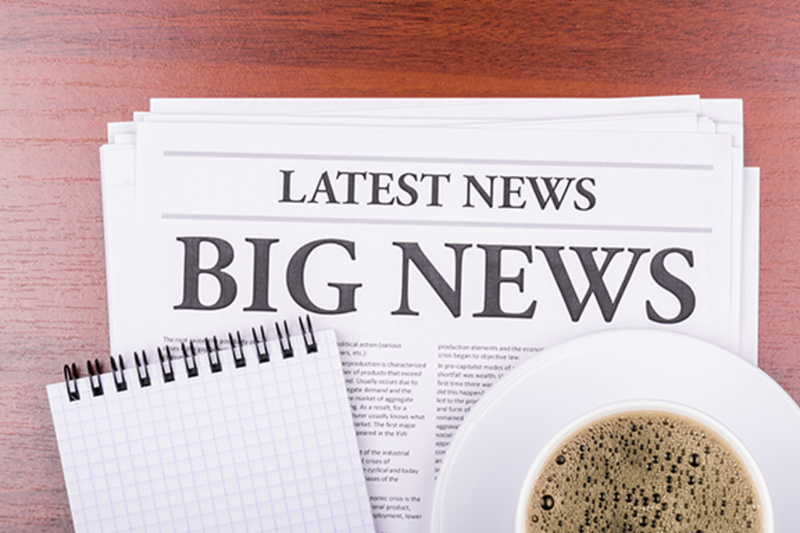 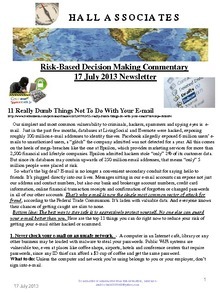 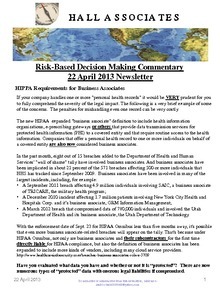 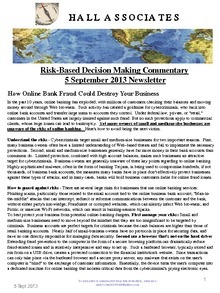 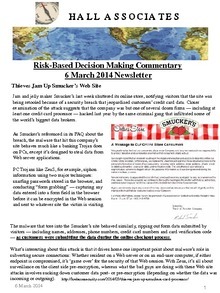 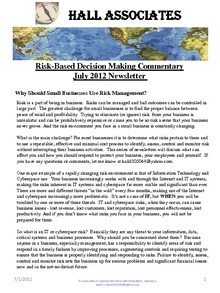 Download "Newsletter 8 may 2013.pdf"
Download "Newsletter 12 may 2013.pdf"
Download "Newsletter 28 May 2013.pdf"
Why Should Small Businesses Use Risk Management? Download "Newsletter Aug 2 2012.pdf"
Download "Newsletter Sept 1 2012.pdf"
Download "Newsletter Sept 3 2012.pdf"
Download "Newsletter Oct 2012 1.pdf"
Are Your E-Mails Really Private – NO! 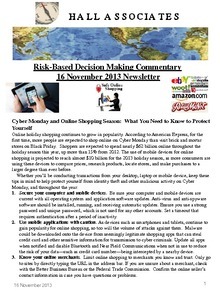 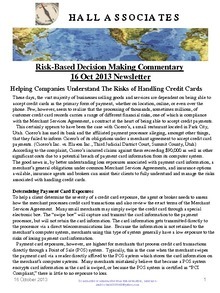 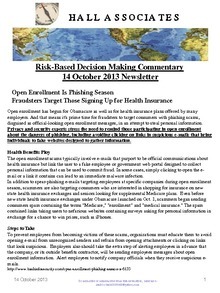 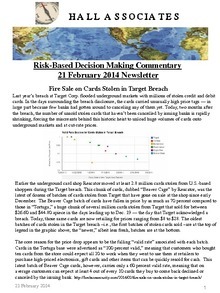 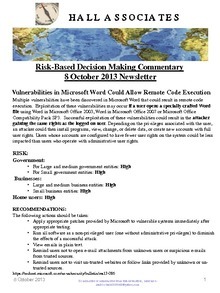 Download "Newsletter Nov 2012 2.pdf"